The Straits Times today reported that the sales committee at Laguna Park has secured the 80% mandate for a collective sale last Thursday. This is two years after an earlier bid was called off. While the asking price has not been fixed yet, it is believed owners of the 258 units have been told they could receive up to $2.3 million per unit. That would make the price for the 99-year leasehold estate in Marine Parade around the $1.2 billion they demanded in 2009. A potential deal for the former HUDC estate then was called off when the sales committee was too pressed for time trying to get the minimum consent level from owners for a proposed lower price. Sources say the tender for the 677,463sqft site could possibly be rolled out as early as the middle of next month. There have been a number of large estates put up for sale en bloc in the past three months. Pearl Bank Apartments at Outram was put on the market for $750 million while the owners of Pine Grove condominium in Ulu Pandan are asking $1.7 billion. The tender for Pine Grove closed on April 19, but the marketing agents have not revealed the outcome. The tender for Pearl Bank closes on May 25. Hawaii Tower and Tulip Garden, with reserve prices of $700 million and $650 million, respectively, have yet to seal any concrete deals. Property market observers doubt any concrete deal will surpass the $1 billion mark this year. The East Coast area has seen some success but on a smaller scale. 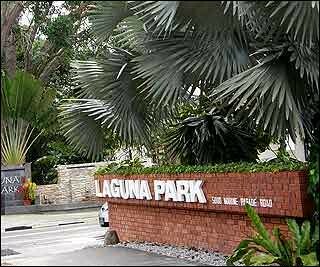 Two condominiums near Laguna Park – Marine Point and Amber Glades – were sold earlier this year for under $120 million each. Some analysts say developers may be shying away from larger sites, preferring smaller, more affordable plots that carry a lower risk if the market turns. No Comment to " Enbloc News: 2nd try for Laguna Park "
Less optimistic outlook from Developers? Are you living in the Pine Grove area? Enbloc News: Leong Bee Court... what's the deal? Please include a name/nickname to your comments! Emerald Garden: A gem within the CBD..?